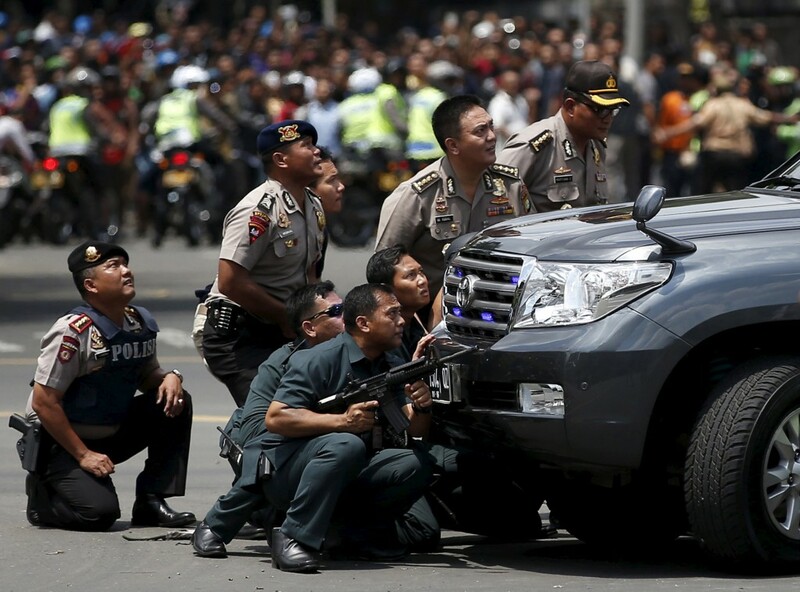 Several attackers set off a series of explosions that targeted downtown Jakarta on Thursday and exchanged gunfire with Indonesian authorities, leaving at least seven people, including five assailants, dead. Updated: The Islamic State group claimed responsibility for the attack on its website. 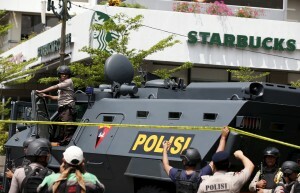 The blasts focused on the Sarinah shopping center in the Indonesian capital with at least one explosion at a Starbucks cafe. Initial images of the aftermath showed bodies in the streets, as police arrived at the cafe, engaging the suspects in a shootout. More explosions soon followed. Hours after the first blast, police said five suspects and two civilians were killed and 10 more people were injured. A Dutch man was among the dead, Indonesia’s security minister Luhut Panjaitan said. Indonesian President Joko Widodo appeared on national TV to say the situation was “under control” and to call for calm. It’s unclear whether the attackers detonated bombs or grenades. The violent scene unfolded near foreign embassies and U.N. offices in a city of 10 million people. Indonesia has the world’s largest Muslim population. The last major attacks were the 2009 bombings at two hotels in Jakarta that killed seven people and wounded 50 others. In 2002, bombings in Bali killed 202 people.